Back when I used to take cake orders (over 2 years ago), I received a pretty unique request. 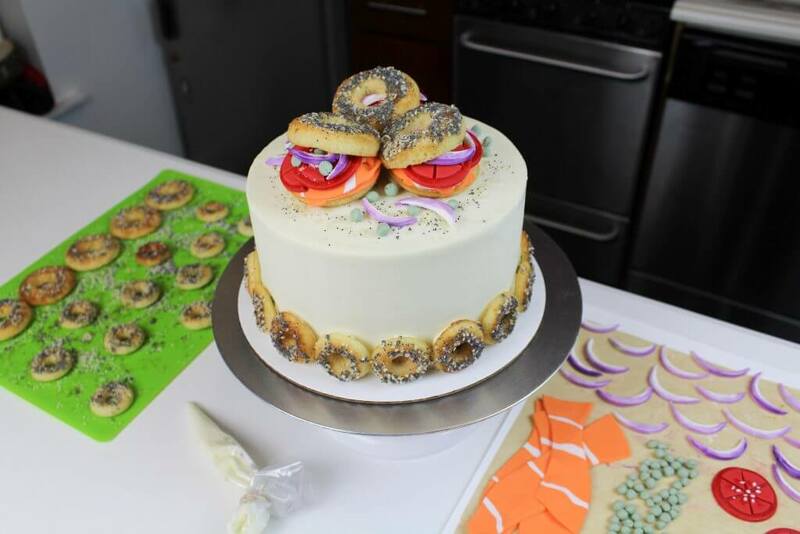 Someone wanted a cake for a bagel and lox enthusiast. At first, I was stumped. I thought about it for a while, and then the concept finally came together in my mind. Fluffy buttermilk cake layers, cream cheese frosting, and mini donut “bagels”on top!! To me, a bagel and lox sandwich isn’t complete without tomatoes, onions, and capers. With that in mind, this cake ended up having a lot of different components! From fondant lox to a sweet everything bagel seasoning (sanding sugar, poppy seeds, sesame seeds, and a bit of sea salt), I went a bit over the top with this one. I have no regrets, and really do feel like it captures the best parts of a delicious bagel and lox sandwich, in cake form. I loved the original cake so much, I remade it to record footage for the Food Network’s social channels. The recipe, and step by step instruction can be found below. 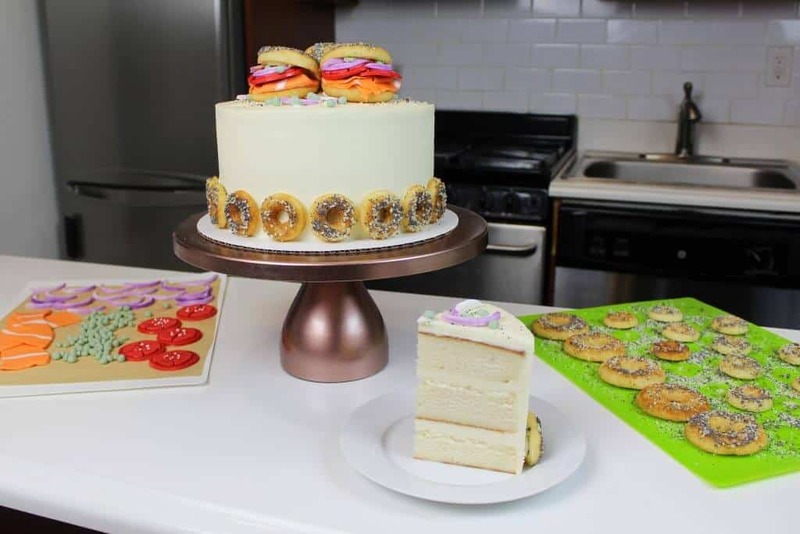 In addition to the cake layers, baked donuts, and cream cheese frosting, you will need white and red fondant, and orange, muted green, and purple gel food coloring. Begin by baking 4, 7-inch cake layers, and making the cream cheese frosting. If desired, use a serrated knife to trim away the caramelization once they are fully cooled. Next, use the cupcake recipe listed below to bake 6 regular-sized donuts, and about 25 mini donuts. Prepare the cupcake batter as instructed, then place it into a piping bag. VERY generously grease donut pans, then carefully pipe the batter evenly into donut pans, filling them about 2/3 of the way up. Bake the mini donuts at 350 degrees for 12-14 minutes, and bake the standard sized donuts for about 20 minutes, until the edges just begin to brown. Allow the donuts to cool for about 10 minutes, then carefully pop them out of the pans using a small offset spatula. Drizzle a generous ring of honey on top of each donut, then dunk each bagel donut into the sweet everything bagel seasoning. Set aside. Stack and frost the cake layers, filling the cake with cream cheese frosting. Once stacked, cover the cake in a thin crumb coat. Chill the cake in the freezer for about 5 minutes, until the frosting is firm to the touch. Cover the cake in a second, thicker layer of frosting. Use a bench scaper to smooth. 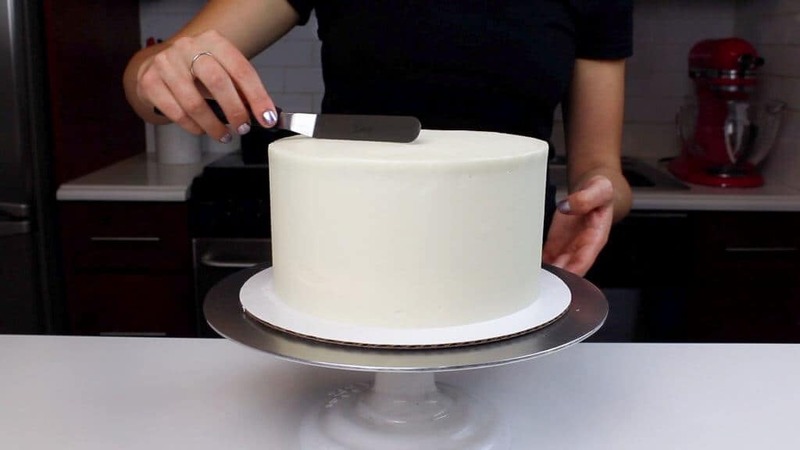 You can see an in-depth tutorial on how to get perfectly smooth sides on a cake here. Place the cake in the fridge to chill while you prepare the bagel sandwich filling. Cover your hands with rubber gloves, and add a few drops of orange or salmon colored gel food coloring to 3/4 of a cup of white fondant. Using the same process, color about 1/4 of a cup of fondant a muted shade of green. I had red fondant on hand, but if you don’t, color 3/4 of a cup of fondant red. 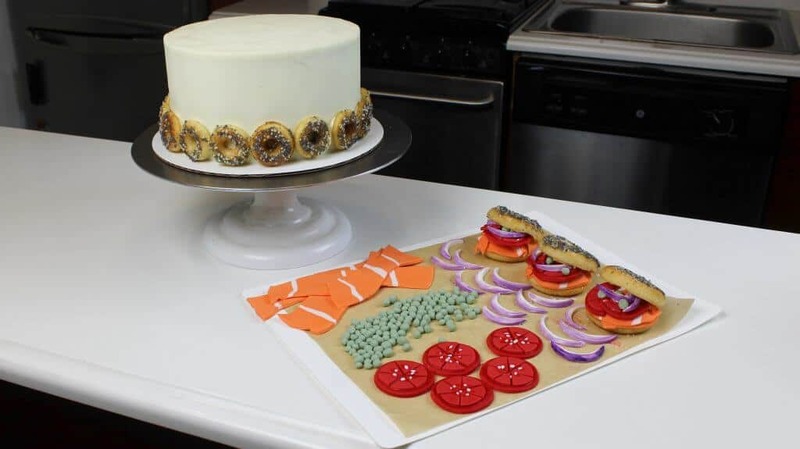 Roll out the salmon colored fondant, and place thin lines of white fondant horizontally across the cake. Gently roll them in the fondant, and then cut the fondant into 3 strips. take one strip, and carefully place it onto the “unseasonsed” side of the donut bagel, wrapping it in a circular motion. Next, make the tomatoes! Roll out the red fondant, keeping it somewhat thick. Use a 1.5 inch circle cutter to cut out the t6 tomato slices. Roll out the remaining fondant to be very thin, and use a slightly smaller circle cutter to cut out 6 additional circles. Slice each thin circle into six equal sections, and place on top of the thick circles the be the tomato segments. 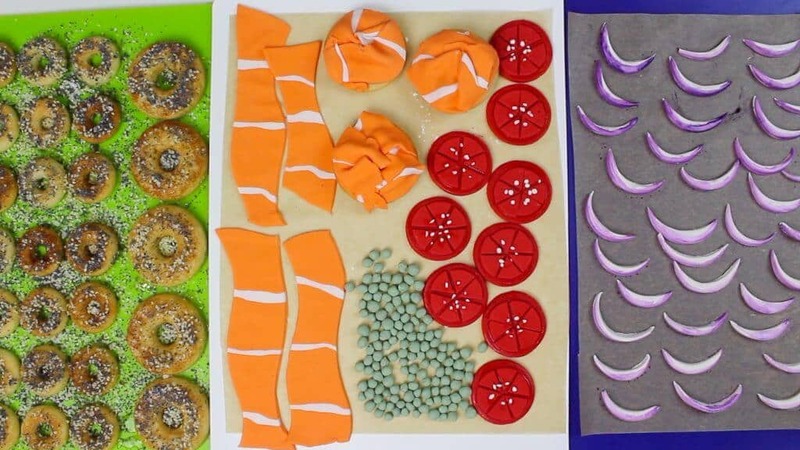 To make the purple onion slices, use the same 1.5 inch circle cutter to cut out about 12 very thin crescent shaped pieces of white fondant. Paint one side of these a light shade of purple using a bit of purple gel food coloring mixed with vodka. Set aside to dry. 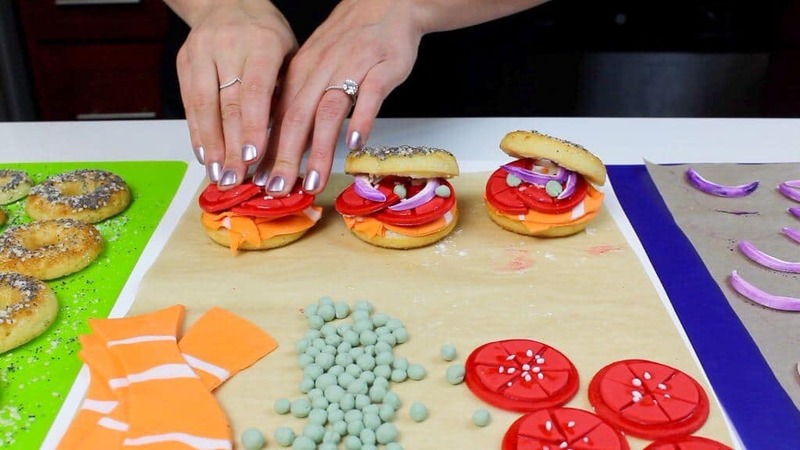 To finish assembling the bagels for the top of the cake, place the tomatoes, onions, and a few capers on top of the salmon lox. Use a bit of frosting to help secure the toppings to one another. Top with an additional bagel, repeat with two remaining bagels. 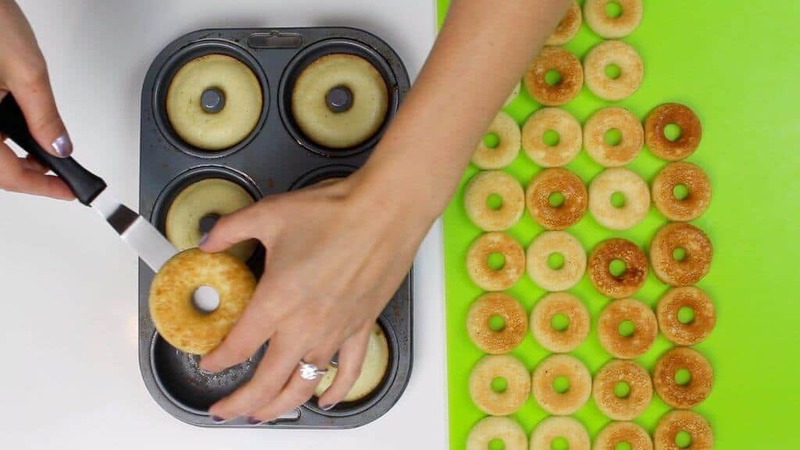 To decorate the cake, place the mini bagels around the base of the cake. Pipe a bit of frosting onto the back of each mini bagel, to help it stick to the cake. 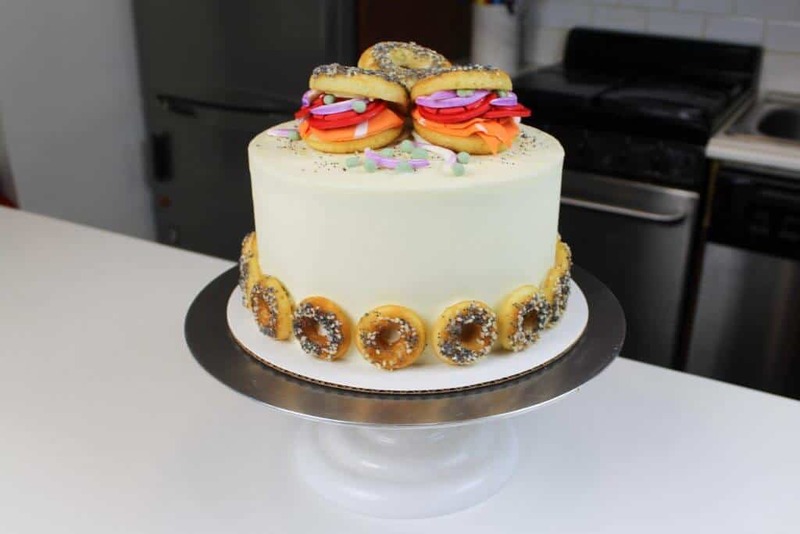 Next, place the bagel sandwiches on top of the cake. Add some of the extra capers and onions to the open space between the bagels, and sprinkle some of the “everything seasoning” on top of the cake. Preheat oven to 350°F. Line four 7 inch pans (for taller layers) or 8 inch round pans with parchment rounds, and grease with non-stick cooking spray. If desired, add in gel food coloring. Mix the batter on a low speed, scrapping the sides and bottom of the bowl part way through. Mix until the batter is evenly colored. Bake for 35-37 minutes if using 8 inch pans, or 37-38 minutes for 7 inch cake pans (or until a skewer comes out clean). Allow to cool for 10 minutes, then run an offset spatula around perimeter of the pan to separate the cake from the pan. Place cake layers into the freezer for 45 minutes, to accelerate the cooling process. Once the layers have fully cooled, I sometimes like to trim the caramelized bits from the sides of the layers using a serrated knife. While these layers bake pretty flat, sometimes I’ll also trim the top of the layers too if I’m working a super special partnership ? A lot of cream cheese frosting recipes taste great, but don’t hold their shape.This can be super frustrating when you’re trying to get super smooth sides on a cake, or pipe some fun designs onto a cupcake!! That’s what makes this frosting recipe so fantastic; it has the tang of a cream cheese frosting, but is sturdy like my classic american buttercream. It’s great for piping on cupcakes, and smoothing on cakes. If the frosting is too thick, add in cream (1 teaspoon at a time). If the frosting is too thin, add in more powdered sugar (quarter of a cup at a time). My one-bowl vanilla cupcakes recipe can also be used to make baked donuts! they're just as delicious as my vanilla cupcakes! Begin by preheating oven to 350°F (175°C) and heavily greasing donut pan (normal donut pan and a mini donut pan). Add the flour, sugar, baking powder and salt to a large mixer bowl and gently mix. Add the buttermilk, and gently stir until just combined. Add in the water, vanilla, and vegetable oil, and mix until the batter comes together. Next, mix in the egg until well combined. Place batter into a piping bag, and cut a small opening (less than 1 cm). Fill pans to make 6 normal sized donuts, and about 20 mini donuts. 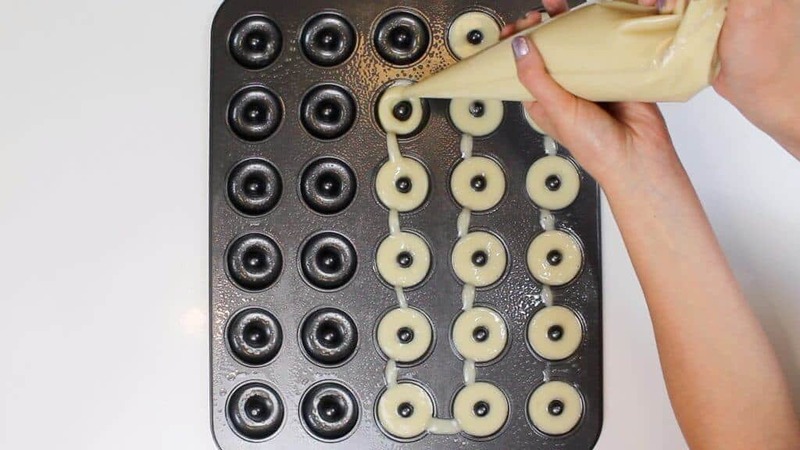 Carefully pipe the batter in a circle to fill each donut mold. Fill about 1/2 full. If you overfill the pans, they will bake out of the mold and lose their perfect circular shape. Bake regular sized donuts for 17-19 minutes, and mini donuts 12-13 minutes (or until a toothpick comes out clean). Allow the donuts to cool before drizzle them with honey. Combine the poppy seeds, sesame seeds, sugar, and salt into a bowl, and stir until combined. Dunk the donuts into the seasoning, until the tops are coated. I had a bit of leftover batter, and ended up making some extra donut bagels for fun! You can also use the extra batter to bake cupcakes. I made the small batch vanilla cake as a first-time trial for making a layer cake and it was excellent! I made the buttercream, which was so delicious, but it made a lot! Would I be able to freeze the icing? How about making the cakes ahead of time… would they freeze well? Thanks for sharing your awesome recipes!! Haha Molly I hear you!! I actually despise working with it myself! I use satin ice, but it dries really quickly and tends to crack if you don’t move fast enough. I’ve heard wilton is the easiest to work! In general, I just try to do everything I can with buttercream, but there are def some cakes that you can’t avoid it.